The following is page four of my ridiculous saga attempting to defeat the Easter Monster. I will try to make the deductions on this page more clear. Previously, many derived inference groups were proven. This page will use Group Z. 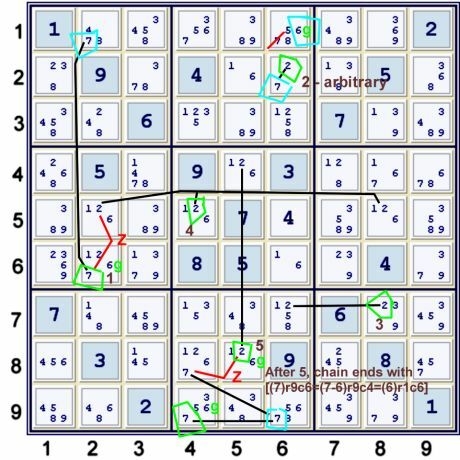 Step 2h using Block Triangular Matrix logic. Block Triangular Matrix is an imposing name. It is merely a manner of logically ordering the inferences. This logical order serves as both a tool for explaining the elimination, and also for finding the elimination. Finding the elimination boils down to counting extra columns versus rows, and getting the count to zero. Here is the same deduction written into a Block Triangular Matrix. Note how (1)r6c6 feeds back to the first column, while (6)r6c6 continues on as if this were a normal Triangular Matrix. 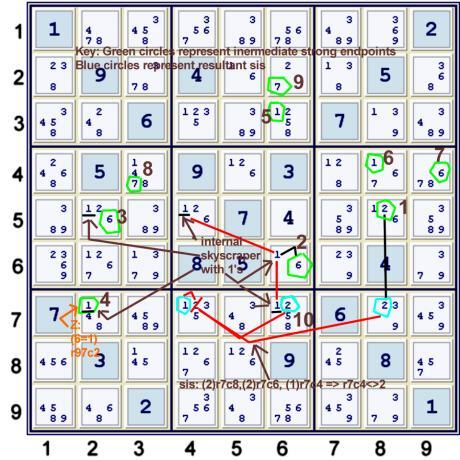 Note how the 2x2 Almost Almost skyscraper on candidate 1 juts out in this matrix. Note further how it is resolved back into what is essential Triangular Matrix form. Previously, I have disparaged the guardian technique as basically unnecessary. However, while tackling this particularly difficult puzzle, I decided to revisit the concept. The guardian idea is basically simple: One cannot color a shape that has an odd number of vertices with only two colors and achieve color alternation. Thinking in terms of true and false, if an odd number of exactly one is true sets form a loop, it is impossible to have a consistent solution. Once one places two truths into the loop, one strong inference set is left with zero truths. If one tries to place 3 truths in the loop, one weak inference set will contain two truths. 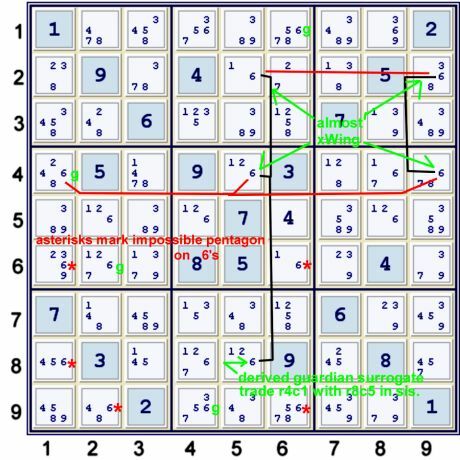 Above, the five locations for 6 that are labelled with a red asterisk form a potential impossible pentagon with 5s. In order for this situation to not occur, at least one of the four locations labelled g must contain a 6. Thus, we have a guardian sis. Simply put, (6)r4c1 was removed from the sis, and (6)r8c5 was placed into the sis. Note that this guardian inspired strong inference set has much overlap with a very strong candidate, candidate 7. Thus, it makes some sense to see if some 7 or some 6 at one of these intersections is ripe for elimination. The use of the guardian set is not required to achieve this elimination. However, it makes the logic faster, and, more importantly, provides a clue of where to look. Since this idea is complex and unwieldy, it is probably supplanted by something more simple except in puzzles that are so utterly devoid of a suitable number of bivalue/bilocation sis. Also, and perhaps just as importantly, in this puzzle once one has some sort of bivalue/bilocation - they almost align so perfectly with each other that interaction between them takes a long look ahead. The guardian idea shortens the look-ahead requirement substantially. Below, I have mapped out a relatively short deduction. Note that the weak inference of Z is used below in two locations, indicated in orange. The guardian derived sis is marked with green g's. Remember that the guardian sis is upon candidate 6. Below, the same description as a TM. Guardians, and any technique like them, that allows one to build a new sis from existing information can be useful in locating possibly strong candidate interactions that may lead to finding an elimination. This concludes this page. Once again, if you have read this far, thanks for your patience!